Red mud emerges as the major waste material during the production of alumina from bauxite and its potential as a filler material in metal matrices has not yet been reported. In view of this, an attempt is made to explore the possibility of making a class of wear resistant metal matrix hybrid composites with nano-structured red mud and micro sized fly ash particles as reinforcement. The micro-sized red mud particles have been modified to nano-structured red mud using high energy ball milling and after 30 hours of milling, the size was reduced from 100 microns to 30 nm. 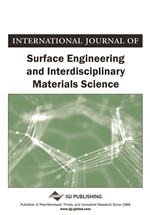 Composites were fabricated by stir casting and experiments were conducted under laboratory condition to assess the wear characteristics of AA2024- 15 wt% fly ash (micro-sized) and varying fractions (2 wt%, 4 wt% and 6 wt%) red mud (nano-structured) hybrid composites under different working conditions in pure sliding mode on a pin-on-disc machine. Tests were conducted with sliding speeds of 200 rpm, 400 rpm and 600 rpm at loads of 10N, 20N and 30N. The increased frictional thrust at higher load results in increased de-bonding and caused easy removal of material and hence the wear rate is increased with increase in normal load. The wear resistance of the composite is increased with increase in red mud fraction. This is due to the increase in surface energy and inter-atomic bonding with increase in nano-structured red mud fraction. The addition of redmud particles to the matrix phase causes dispersion strengthening and hence the strength as well. Wear resistance is increased with increase in redmud fraction. Research grade 2024 aluminium alloy is procured and the solid waste materials red mud and fly ash are obtained from NALCO Bhubaneswar and RINL, Visakhapatnam respectively. The chemical composition of red mud, fly ash and AA2024 determined by wet chemical analysis are furnished in Tables 1-3 respectively.